Pinti´s Lodge is located in the little town of Itaibate on Corrientes province, Argentina. 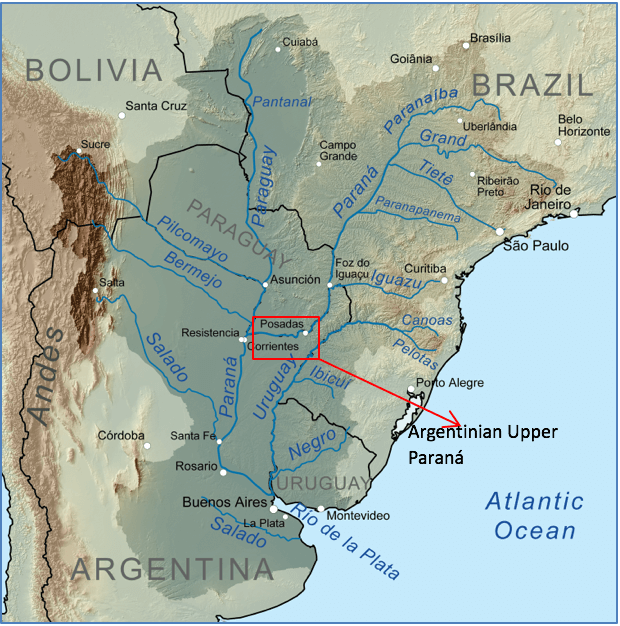 We operate in the area known as Upper Paraná. This region is a large tailwater system about 150 kilometers below the Yaciretá Dam. Because it is a tailwater, the water generally runs clear, unlike other large rivers in northern Argentina. The environment often surprises anglers with its unexpected beauty. It is normal to fish in a landscape framed by islands with palm trees, white sand flats, or banks lined by a thick jungle with howling monkeys and Toucans. Guests typically fly directly from Buenos Aires to Corrientes Capital or its sister city, Resistencia. It is a 1 hour commercial flight operated by Aerolineas Argentinas. Alternatively, overnight luxury buses leave on a regular basis from Buenos Aires to Corrientes, which is roughly a 12 hour ride. Guests will be met by a representative of the lodge upon their arrival, and from the airport you will shuttled to the lodge via private car or van, with a trip time of about one hour (Corrientes) or one hour and forty minutes (Resistencia) depending which airport you arrive. Your main quarry on the Rio Parana will be explosive Dorado up to about 25 pounds, but most will be 5 to 10 pounds. This is one of the best destinations for Dorado anywhere on earth, but don’t let that distract you from the other exotic species available to fly fishermen. Pacu is considered the permit of Argentina, and is a cult attraction among experienced anglers because of its size and power. Pacu in the 14 to 25 pound range are caught, but most will be 8 to 12 pounds. The Pira Pita is a smaller fish up to about 10 pounds, and acts basically like a trout. It is called the Parana Salmon because of its red meat, though It looks nothing like a trout or salmon. It is a hard, acrobatic fighter which can be skittish and sometimes hard to hook. Many fisherman go to the Parana just to fish for Pira Pita, as it is unique to this area. Pacu and Pira Pita take dry flies, often dead drifted as one would for trout. It is an incredible experience to see one of these big bruisers slowly come to the surface and sip in your bumble bee imitation. Other species include dentuda (a small barracuda looking fish) and palometa, the largest of the piranha. Most of the fishing is done from boats, though when the dam releases a lot of water, it is sometimes possible to wade the small side channels, much like you would a trout stream. Because it is a tailwater, it is not susceptible to low water. The Parana is a huge river, several miles wide in some places, and you will mostly be fishing side channels that are 50 to 150 yards wide. The boats are designed so two fishermen can be casting at the same time. Your guide will keep you in position with an electric trolling motor while you drift downstream parallel to the bank, trying to hit the most productive looking lies along the way. You will be at the same time taking in the verdant ecosystem of the Parana, which is a jungle environment. There are monkeys in the trees, toucans, caiman and an array of unique birds and animals. The nature of the river and its fish rewards competent casters, so it is advisable that you practice your accuracy with big, wind resistant flies. The reason is that much of the fishing is centered around trying to hit specific targets near tree stumps, behind rocks, under overhangs and along cut banks. Accurate casts are paramount to success. The fishing day is split into a morning and evening session, with lunch at the lodge and time for a siesta, the Breakfast is served at about 6:30 AM, which allows you to be on the river at first light, you will be fishing the banks and islands of Itatí and Rzepecki areas, locations famous for their concentration of fish. Around noon you will break for lunch and a siesta, and then return to the river at roughly 4:30 PM for fishing until dark. This maximizes the most productive bite time, while also avoiding the hottest part of the day. During the day we have the coolers on board full of drinks, fruits and sweets; also we can arrange a special day to prepare a traditional meal on the riverside. December – October. Because it is a tailwater, the upper Parana is not negatively affected by seasonal rains. The fishing remains surprisingly consistent nearly 11 months out of the year. Only November is closed to protect spawning dorado. Dec-March is the best time to target Pacu when they congregate under overhanging trees to feed on falling nuts and berries, after which they return to deep water and are more difficult to catch on the fly. Dorado are THE top-level predators of their domain, and have a voracious appetite to match. This requires us to throw large, noisy flies to get their attention and imitate the local baitfish. Coming with the proper rods & lines to accomplish this will make your fishing experience as enjoyable as possible. Please review the list below. 7-9 weight rods. Avoid rods longer than 9 ft, as shorter rods tend to be more accurate and better for leveraging large fish out of structure. Tropical Fly Lines We prefer WF lines with an aggressive front taper to help turn over large flies. Rio’s saltwater clouser line is great, as is its F/I saltwater line. Standard bonefish lines work well too, especially if you cut off the front 4-8ft to help with turnover. Wire leader: Our favorite brand is American Fishing Wire in 25 – 30lb. Your guide will have this available as well, but it’s nice to bring your own if you decide to rig up without him. Flies: Anything big (4-6 inches on 1/0-3/0 hooks), gaudy and noisy will do the trick. Dark colors are the most popular, with black being the most dominant color. Deceiver style flies with spun deer hair heads and bead chain are very effective. All the fish species of the Parana river have powerful jaws and sharp teeth, so using more durable synthetic materials over feathers is recommended. Puglisi flies (www.epflies.com), offers a great selection of durable, easy to cast flies. A weed guard is also useful to reduce snags, especially if your casting isn’t always 100% accurate. Your guides will have flies, but we suggest you bring a selection of your own as well. Let us know if you have additional questions about tying or buying dorado flies. Clothing: Summer in northern Argentina can be very hot, so prepare for the climate like you would any tropical destination. Lightweight clothing with ample sun protection is a must. Bring a wide-brimmed hat, quality polarized sunglasses and sunscreen. A light rain jacket is also recommended. Bugs are typically not a nuisance during most of the day, though mosquitoes can become thick at dusk. Bring bug repellent to apply before you get off the boat at the end of your evening sessions. The Lodge is located on the river side. The rooms are classic hotel accommodations, with a bit of aristocracy thrown in and wi-fi service. Each one has air conditioning and a private bathroom. Meals are classic Argentine fair with copious amounts of good wines. During summer time usually served outdoors on the garden or deck overlooking the river. Our clients rave about the hospitality of the Pinti’s Lodge and the overall environment. Bird life is incredible and the viewing is excellent rigth out your front door. Also the complex has a big dining room with a full glass wall excellent to see river while the anglers are taking the breakfast or having lunch. We operate in the area known as Upper Paraná in a large tailwater below the Yaciretá Dam. Thanks to classic features of a dam fed tail water river, the Parana is consistently producing fish 11 months out of the year (except November). Along with an arsenal of boats, you will be staying in well appointed facilities, with a main building for sharing stories and libations. If you feel like whipping up some of your own fresh fish, there is a BBQ pit outside for the DIY guys. Oh, and there’s covered parking as well. $780 pp/night double occupancy based. $1100 pp/night single occupancy based. $300 daily non anglers or non fishing day. $400 per boat on half day fishing (arriving or departure date). Meals and accommodations at the lodge, fishing license. International and domestic airfare, transfers/food/hotels in Buenos Aires, alcohol, gratuities, fishing equipment. Do you have more questions about this destination and want to learn more? Would you like to combine Itati with another destination? Busy schedule and unsure of how to fit in a trip? Drop Us a Line and we’ll be happy to get you squared away!